HUMANITY IS IN TROUBLE. When the 10 largest corporations on Earth have more combined economic power than 92% of all countries on Earth combined, the 50 largest financial corporations control wealth equal to 90% of Earth’s GDP, the richest 1% of humans have more wealth than 99% of the world combined, and the eight richest humans have more wealth than the bottom 50% of Earth’s entire population combined . . . it’s safe to say humanity is in trouble. ACTION-ORIENTED. This is the only book you ever need to read to understand exactly what is wrong with our global economy today and how to fix it. 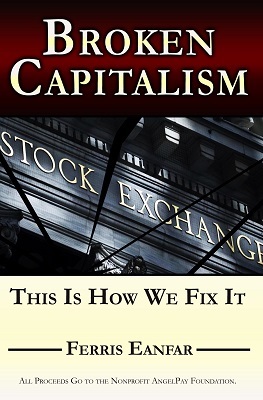 Learn exactly what you can do to help fix Broken Capitalism before it’s too late. REAL-WORLD EXPERT INSIGHT. Written by International Political Economy expert, financial services professional, and former U.S. Government Intelligence operative, Ferris Eanfar. Broken Capitalism: This Is How We Fix It provides unique and refreshing insight into the murky waters of Earth’s economic and political systems, banking systems, globalism, artificial intelligence, corporate governance, and the geopolitical affairs that have shaped and distorted our global economy. SUCCINCT & EASY TO READ. Written in a unique style for easy reading and comprehension, this book is used by organizations as a no-nonsense primer on how the global economy really works. MEANINGFUL PURPOSE. All book proceeds go to the nonprofit, nonpartisan AngelPay Foundation. See the Hardcover Dust Jacket. Click to Reveal the Book’s Table of Contents. CHAPTER 2 – WHAT’S WRONG WITH THE GLOBAL ECONOMIC SYSTEM? What’s Really Wrong with the U.S. Banking System? Do Corporations Maximize Human Life? CHAPTER 5 – WHY IS THE GOVERNMENT SO BROKEN? CHAPTER 9 – WHAT IS VALUE? HOW MANY COMPANIES IS ENOUGH? If Corporations Are People, Then . . . The hardcover, paperback, and eBook editions are available on Amazon and most major bookstores worldwide. The audiobook edition will be released later in July, but you can listen to a preview here. Bookstores that don’t already have it can obtain copies through their existing Ingram wholesale account, as described below. Independent bookstores, libraries, universities and other education organizations, and general corporate resellers anywhere in the world can purchase through their existing Ingram accounts. 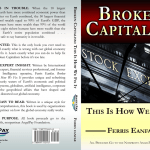 As the world’s leading book distributor, Ingram delivers Broken Capitalism: This Is How We Fix It at attractive wholesale discounts with easy terms to ensure your book sales are profitable.